Also available on . 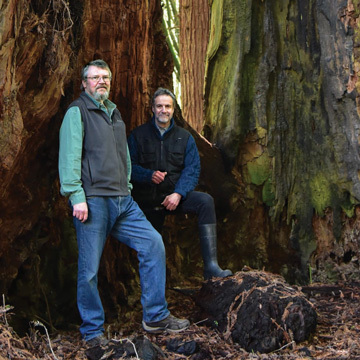 . .
Recording in a small cabin on the northern California coast surrounded by redwoods and overlooking the Pacific Ocean, Pacific Woods is Harrison Goldberg on tenor, alto & soprano saxophones, and Dave Jordan on electric bass. 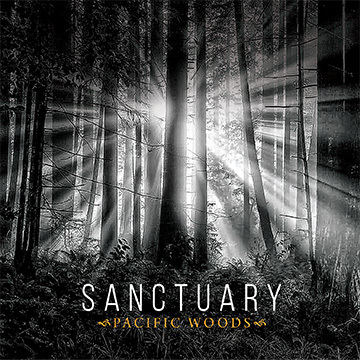 Following in the spontaneous musical footprints of their pilot recording, "Pool of Mirrors," Pacific Woods set out with their new album, Sanctuary, to explore new landscapes in their collective musical imagination. Improvisation between two different instruments & musical personalities generates tunes that can not be created through a single musician's vision or intellectual analysis and composition; the music emerges from the collaboration. What emerges on the new album are landscapes that take the listener to unexpected places that may at first appear alien, but are cushioned by whiffs of familiarity. The music lures you in, rather than demanding that you listen. Most of the tracks on Sanctuary are quiet, meditative, first-take improvisations. They include a jazz waltz, a tone poem, a blues, a ballad, a tango, a tune with a Middle Eastern vibe, and a rock-style romp. For example, "Harry's Hat" is a tribute to Goldberg's charismatic paternal grandfather and namesake, Harry, an Eastern European immigrant, who made caps and smoked "Between-the-Acts" cigars. From his business, "Harry the Hatter," Harry loved to watch the dramas unfold on the avenue in New Bedford, Mass. There are also a few studio-edited tunes which take advantage of overdubs and studio effects. "Castles of Cordoba" uses multiple saxophone voices (Harrison's "saxophone choir") over Dave's pulsing electric bass, creating an orchestral Spanish-tinged piece with echoes of Rodrigo and Gil Evans / Miles Davis. But we avoided the temptation to fix all the flaws using digital magic, and let the spontaneity of the music speak for itself. Pool of Mirrors is spontaneous, intuitive music; no plan, no composition -- just in-the-moment conversations between a sax player and a bassist. It's got flaws, which is how live improvised music naturally sounds. We avoided the temptation to fix all the flaws using digital magic, and let the music speak for itself. We've both studied music for many years, but at the moment of creation, we can't know where we'll end up; we just play. And afterward, neither of us can explain how we got to where we did. The result is something more than the sum of the parts. Playing less is better than playing more. Responding to the unexpected is more interesting than repeating a fixed idea. In a musical discourse, peace and discord can inhabit the same space, without the risk of creating a lasting conflict. Listening to Jazz, through a variety of styles, one can often conjure up memories of people and places, sometimes maybe even aromas. For me, it is almost always a specific type of room. For example, Danilo Perez brings to mind Sweet Basil on 7th Avenue in New York. Diana Krall reminds me of the Oak Room at the old Algonquin on 44th Street. There are, however, times when my mind connects music with images or memories that in reality have no direct connection. That happened recently when I sat down and listened to a new CD by Pacific Woods. The nature of the 8 tracks brought two clubs to mind. There is Smalls in New York City and the much older club, Jazz Café Alto in Amsterdam. 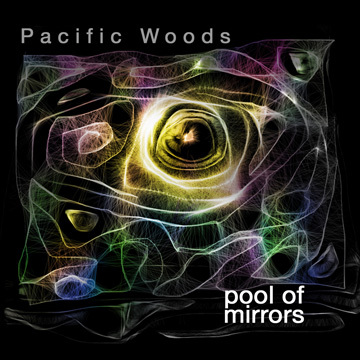 In both cases I knew that the music on the Pacific Woods CD Pool of Mirrors would fit perfectly in these smallish, moderately-lit establishments. Both are places where you could take a table (preferably off to one side of the room), sit back, and get lost in the music. Harrison Goldberg (tenor, alto, and soprano saxophones) and Dave Jordan (electric bass guitar) paint a tapestry that enables the listener to get lost, happily. Jordan and Goldberg clearly both love what they do, and their musical relationship on this album is part tango and part kabuki; and neither in a literal, musical sense. Like the tango, these two musicians offer a counterpoint, one to another. Like Kabuki, the music is highly stylized. Neither term should be construed as off-putting. This is a good thing! I could almost feel the perspiration on the brick walls at Smalls. I could almost smell the thick cigarette smoke at Café Alto. Like a soothing thought when you begin to dream, Pool of Mirrors will take you away. As often happens, there are echoes of things you've already heard in their improvisations, but that familiarity is welcomed. This is a collection that is perfect for listening in the background with conversation; or with headphones or earbuds, and drifting off all by yourself. I'm always excited when a piece of music can take you away. Put the cd on and lose yourself in the atmosphere. As Chet Baker suggested, "Let's get lost." David Steffen writes about history and the arts under the pen name JazzDavid. in New York, and later worked for BMG Music (NY) and A&M Records (CHI, LA). Recording in a small cabin on the northern California coast surrounded by redwoods and overlooking the Pacific Ocean, Pacific Woods is: Harrison Goldberg and Dave Jordan. Harrison has performed on tenor, alto and soprano saxophone with a variety of groups, including Neon Egypt, Lavender Fog, BAKU and Stardust Messenger. 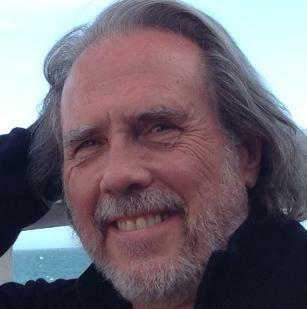 An alumnus of Berklee College of Music, Harrison has spent a lifetime in music from East to West Coasts. Dave plays a left-handed electric bass guitar, and is also a recording engineer. Years ago, Dave played keyboards with Limbic Seminary, an eclectic folk-rock band. Prior to forming Pacific Woods, Dave & Harrison were members of the world music group Cloudfire. For more info, visit PacificWoodsMusic.com and HarrisonGoldbergArts.com.